UNITED NATIONS, Sep 9 2017 (IPS) - Two years have passed since the world came together to adopt a truly remarkable framework for common progress: the 2030 Agenda for Sustainable Development. The Agenda is transformative and inspiring its own right. That it was agreed at a time of severe political divisions on so many other issues was especially encouraging. Since then there has been very promising momentum around the world. The Forum was a welcome opportunity to identify implementation challenges at the country level – and to share solutions, knowledge and best practices. It is clear that Member States are taking vigorous action to implement our SDGs. In many countries, Heads of State and Government are personally leading the charge, incorporating SDGs into national plans and visions, in some cases, incorporating sustainable development principles into legal frameworks too. In line with the interlinkages of the SDGs, we see governments walking the talk in terms of national coordination, resource mobilization and budget allocation, and engaging parliaments and local authorities. Stakeholders, including business, NGOs, and the scientific community, are also helping to lead the implementation process. At the HLPF, which attracted over 5,000 participants this year, I was pleased to see so many enthusiastic actors. Next year, the list of countries ready to engage in the voluntary review process has already reached its maximum of 44. To me, this is an unmistakable signal of commitment. The UN Development System, too, has shown its firm commitment to implementing the 2030 Agenda, by providing country-level support. To date, 114 governments have requested support from UN Country Teams on SDG implementation. That is the good news. However, our assessment clearly shows that the pace of progress is insufficient to fully meet that ambition. We see, in the unfinished business of the Millennium Development Goals as we transition to the SDGs, that progress has not been even across regions, between the sexes, and among people of different ages and constituencies. Inequality remains a significant challenge, both within and among countries. Children and youth, women and girls, indigenous people, older people, rural workers, people with disabilities, migrants and people affected by conflict remain vulnerable, deprived of their rights and opportunities. Every day, they must be empowered if we are to be true to our commitment to leave no one behind. The latest data show that extreme poverty is down to 11 per cent, but this translates to an estimated 767 million people still living with severe deprivation. Although Eastern and South Eastern Asia made significant progress, 42 per cent of people in sub-Saharan Africa continued to live in extreme poverty. We do need to put emphasis on data to know where those are that are being left behind. Maternal deaths have declined, but we need to double the rate of reduction to meet the target. This means a concerted effort to invest in universal health care, with a focus on primary health care and secondary referral. The environment continues to bear the brunt of man-made actions, leaving more than 2 billion people to confront water stress and nine out of 10 city dwellers breathing polluted air. And there has been a significant increase in violent conflicts in recent years, despite a decline in homicides and better access to justice for more citizens around the world. So we are challenged. To eradicate poverty, address climate change and build peaceful, inclusive societies for all by 2030, key stakeholders, including governments, must drive implementation of the SDGs at a much faster rate and at much larger scale. Poverty remains a major challenge. Increasing focus on the poorest, most vulnerable, furthest behind and hardest to reach is critical. To ensure no-one is left behind, we need to monitor progress through disaggregated data, by building the capacity of national statistic systems and by improving data availability. We must also advance on gender equality. The empowerment of women and girls is an enabler for the whole 2030 Agenda. Currently, gender inequality is deeply entrenched. We see it in the slow progress in women’s representation in political life and in decision-making within our own households. We see it as well in the violence, most often with impunity, that women and girls face in all societies, which also affect the mental health of women – which is also deserving of greater attention. The systematic mainstreaming of a gender perspective in the implementation of the whole 2030 Agenda is therefore crucial. Another critical area is climate change. At this point I would like to express my sincere condolences to those who have recently suffered from environmental disasters, from landslides in West Africa, widespread floods in South Asia and, as I am speaking, from immense destruction and loss of life in the Caribbean region with Hurricane Irma. My heart goes out to them. On UN Staff Day—September 8 — I also wish to acknowledge all the colleagues working on the ground in the affected regions. Implementation of the Paris Agreement is central to the success of the 2030 Agenda. The UN System supported countries in identifying and declaring their climate targets in the lead-up to the Paris Agreement. This has carried forward – through multilateral initiatives such as the Nationally Determined Contributions Partnership – with translating targets into action, coordinating support, and providing access to climate finance. The priority now must be to scale this up and accelerate action to achieve country targets. The Secretary General’s climate summit in 2019 will provide momentum for increased ambition. However, the financing requirements for realizing the SDGs and the Paris Agreement are considerable. They call for transformative solutions. The Addis Agenda provides the financing framework and blueprint for global cooperation. In many SDG priority areas, additional investments are essential. Development banks have significant potential to scale up their contributions to sustainable development financing. We also need countries to meet their commitments on ODA and we need to leverage South-South cooperation. But public finance alone is not sufficient. We need to work in partnership with the private sector to ensure that all financing becomes sustainable and contributes to the SDGs. A growing number of businesses are considering social and environmental factors in their investment decisions. But here again, we need to go to scale. The SDGs are also opening new business opportunities. I am proud to say that the UN is supporting efforts by the private sector to better align their internal incentives with long-term investment and with sustainable development indicators. Ultimately, progress will only be achieved through genuine and meaningful partnership. Partnerships at all levels are key to ensure continued momentum and implementation. Let me emphasize here the key role of local governments and mayors. The UN has a critical role to play in bringing all stakeholders together and supporting countries to achieve the Sustainable Development Goals. But the UN too must change to be an effective, accountable and responsive partner. As I have said before, the 2030 Agenda is a bold agenda for humanity and requires equally bold changes to the UN development system. The UN development system has a proud history of delivering results and generating ideas and solutions to improve the lives of millions of the poorest and most vulnerable. Yet, the current model of the UN development system is insufficient to match the ambition, of the new agenda. 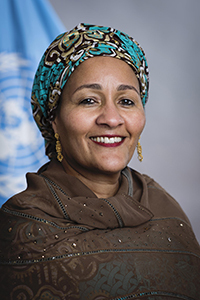 In June, the Secretary-General put forward 38 concrete ideas and actions to reposition the UN development system to deliver the integrated support needed to achieve the Sustainable Development Goals. Combined, these ideas offer a roadmap for change that can significantly enhance the system’s effectiveness, cohesion, leadership and accountability. In the coming month, we will continue to confer with Member States and the UN development system, and we look forward to continuing to work closely with you and your representatives as the process unfolds. We intend as a system to meet the ambition. The 2030 Agenda is the international community’s best tool for a more prosperous and peaceful world. It is relevant to all countries and all people. And it belongs to everyone. Its success, in turn, will depend on the active engagement of all actors for people, peace, prosperity and a healthy planet. My simple appeal today to all of you is to stay engaged, help us keep the ambition high, and work with us in this collective endeavour for a better future for all.